A few weeks ago I went on my first run in a while. The longer I stay out of shape, the longer I run, so I suppose this should be motivation to get out more often. Lately it just puts on my pressure on my knees that turn 40 this year and need less stress. That day I went six miles and they were torturous on my legs that really wanted me to stop at 3. On that run I thought a lot about what my life has been like since taking a big leap into this wilderness known as entrepreneurship. I came upon a turn in my run down a rough part of the path, and it hit me like a rock. Vision is equal parts light and darkness. 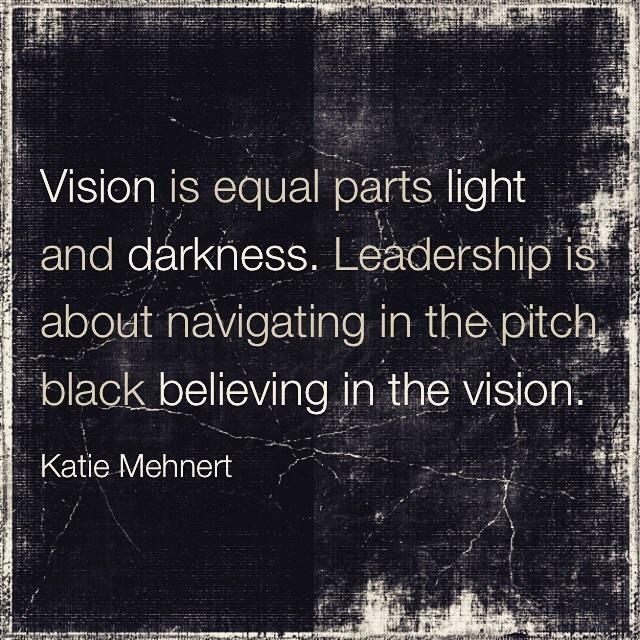 Leadership is about navigating the in the pitch black believing in the vision. Life in this chair has its bright lights and darker moments. But they are mine. My run reminded me of an 8 mile leg of the Texas Independence Relay. I ran this years ago as a part of my training to run the London Marathon. We ran in the dark and 2 days straight. (Yes, I did that and yes it was crazy.) But I lived to celebrate it! It was 2:00AM. In the crappiest weather and howling coyotes in the Texas night out the open country, I just kept running my leg of the race. The caravan of my team was just behind me with many of them sleeping in the van or back at the nearby school catching a shower. But not Tom Lober. Tom got out of the van and told me to keep pushing. He told me with each stride I took that we were that much closer to the hand off point. And that no matter what little noises I heard along the way, I should keep going. He was right. I did and we made it. He saved me that night from the darkness. But he told me later on I didn’t need saving. I already knew the way. My father once told me that if you have people who love what you’re doing and people who hate what you’re doing that you’re on the right path. “Keep going,” he would say. I believe it. I say bring on the darkness. You see because most people need the light. They need the path of certainty. They need the crutch of an answer. They need to feel in control and full of power. But the real power comes from believing in the vision and going the distance in the dark knowing your true north. Real power doesn’t care what the vultures in the field have to say because they are too afraid to approach the road to go the distance. They prey on others for their own survival. Close your eyes. Breathe. Run blind. You got this. Faith always sets you free. Thanks Tom. I miss you. Thanks Katie! I needed to hear this message today. Thanks ClariCe. I needed to get this out. Great insight! I’ve always thought that if no one was pushing back, I probably wasn’t making much of an impact.